So it looks like the European Council has agreed a real-terms cut in the EU budget for the 2014-2020 period. This has, understandably, been labelled unacceptable by the 4 largest groups in the European Parliament. Yet, fearing coercion from Member States, EP President Martin Schulz and leader of the EPP Group Joseph Daul plan to hold a secret ballot for the European Parliament’s vote on the budget. This is really no good – the European Parliament, the chamber of the people, should have the very best standards of openness and transparency. If MEPs are to be pressured by their national parties and national governments, we need to know who is succumbing to such pressure, so the vote must be in the open. So, if you want to have an open budget vote in the EP, please add your name to this petition! Images used in the petition – all CC Sharealike License from Flickr. 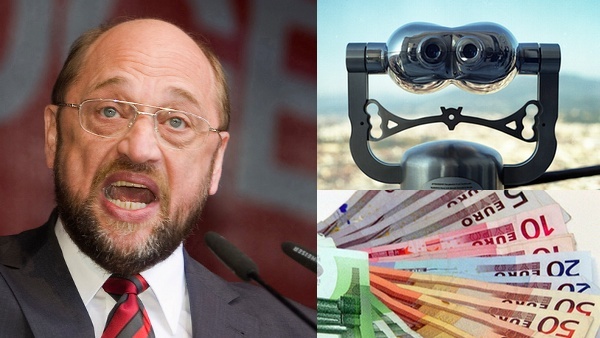 Schulz | Binoculars | Euros. @Martin – so in some way you’re agreeing with me!? Ralf Grahn in his usual fashion brands the Council’s budget decision a “disgrace”. He is right, just as a stopped clock is right twice a day. If European integration is the only value that matters to someone, then it doesn’t really matter what the EU does. Most people, other than extreme egalitarians, concede that there is more than one thing that matters in life. Each time the EU violates a fresh value, Europhiles must make their choice. Here we see the EU proposing that ordinary budget votes be taken in secret. Maybe this is necessary to bring Europe into line with North Korea, but that seems like an unimportant goal. Are Europhiles prepared to compromise transparency, accountability and democracy for their dream? It seems some of them are. I do not ask, what would they *NOT* be prepared to sacrifice, because are they are not so stupid as to enter into such a discussion. But know this: yours is an empty, sterile and lifeless creed, yet you prise it above freedom, democracy, equality, efficiency, justice, transparency, accountability and every other value your countrymen hold dear; this is no way to waste a mind or a lifetime. @Ralf – I know that’s the danger. But the important question for me is how should the European Parliament behave? Should it behave like a decent, transparent, legitimate parliament? Or one that cowers behind the Member States, fearful of what national party leaders might do with an election around the corner? As a federalist who believes strongly in representative democracy I want the former, above and beyond everything else, hence why an open vote is the only correct answer. Pingback: Bloggingportal.eu » Blog Archive » The Week in Bloggingportal: Show me the money, Jean Monnet and Margaret Thatcher! Most of the heads of state (or government) who constitute the European Council are also the domestic party leaders who more or less dictate the eligible candidates in many member states ahead of the EP elections in 2014. Do you really want the European Council members not only to produce this budget disgrace, but also to remote control the MFF vote of the European Parliament, the only directly elected EU institution? That is actually the most likely outcome here. Talk is cheap, but I suspect the current MFF will be approved by the Parliament. Whether it still would under normal voting procedures is an interesting question. It’s for every citizen to determine whether someone is cowardly or not, or consistent or not. What I want to avoid is a bunch of MEPs who *say* they oppose the Council position, but when it comes to the vote the approve it. I want to be able to see the double standards. And how can you tell the difference between “a cowardly one” and someone who simply disagrees with you? sorry – meant 53 not 57. @James – yes, it’s disappointing! More people have tweeted the link than have signed… But see Martin’s comment – lots see the Schulz point of view. @Martin – no. We need to work to make sure MEPs are accountable to us, as citizens. It’s a vital principle. I want to know who the cowardly ones are. I can’t believe in the year 2013 that anyone is arguing that the European Parliament should hold anything other public votes. I can’t believe we are even discussing this. I am as pro-European as they come, but this is nonsense. I disagree. There’s already way too many shenanigans going on with Member States undermining the independence of “their” MEPs. They could release the result per political group, if they like, but I can see the benefits of keeping the votes of individual MEPs a secret here.